The skeleton has the form of a regular double sphere. Diameter of the outer sphere 0.09mm, of the inner sphere 0.03mm. The sphere wall is perforated by numerous pores 6µ-7µ in diameter. The pores are surrounded by regular hexagonal frames which turn inward in the form of a funnel; since the frames of the pores are contiguous, the surface of the sphere seems as if it were polyhedral. 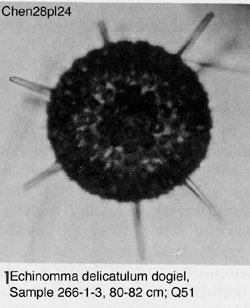 From the corners of the facets extend numerous thin, rather short (25µ) secondary spines; in addition there are 12 main spines of approximately 0.09mm length. These spines extend into the inside of the inner sphere. The interval between the pores is greater than the diameter of pores.